What of the geodesics? 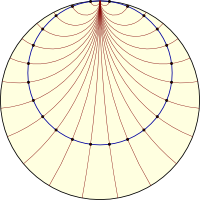 It turns out that the geodesics on the Klein disk are chords that cut the boundary, as shown in the figure to the right. Straight lines in this model are actually straight Euclidean lines. The similarity to the disk model, however, should not be forgotten; the geodesics still meet the boundary in the same places, and even the main parameterization looks the same: , and . where is the determinant of the metric. When we take the required derivatives and substitute in to find the Gaussian curvature, we find that (big surprise) it is a constant: -1. Hence the Klein model is consistent with the other models of hyperbolic geometry. 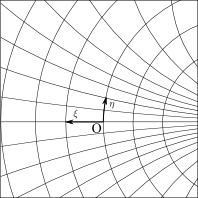 Consider the image to the right drawn in the Poincaré disk, with line a diameter of the disk. Let us consider what happens when we move the point to the right while keeping the distance fixed. The angle will converge to the angle shown below, the angle of parallelism. 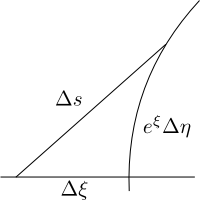 This angle is only a function of the distance of point to line . As goes to infinity, it becomes an ideal point on the boundary of the disk, while the segments and become the geodesics and . The circle converges to a horocycle, a curve whose normals converge asymptotically. The figure on the right shows a horocycle in blue and some of its normals in red. 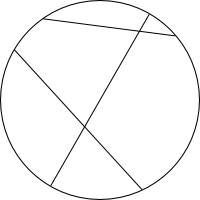 Notice that the horocycle is tangent to the boundary of the disk, whereas hypercycles would intersect it twice (geodesics being hypercycles orthogonal to the boundary). In the half-plane model, horocycles are circles tangent to the -axis and horizontal lines, as can be imagined by performing the usual mapping from the disk to the upper half plane. If we imagine a family of horocycles, it is not hard to see that they span the entire hyperbolic space, so that it would make sense to create a set of coordinates from them and the asymptotic lines orthogonal to them. Consider the family of asymptotic lines meeting at an ideal point on the boundary of the unit disk (the point where is crosses the positive real axis, say), like , , and in the above figure, as well as the horocycles orthogonal to them. 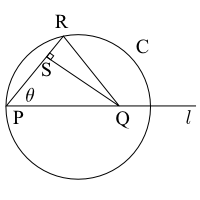 Let us define a set of coordinates so that measures the horocycle distance from some arbitrary origin (the center of the disk, say) and measures which asymptotic line off of the real axis you are on, as in the figure to the left. Now let us consider the arc length along horocycle 1 as . 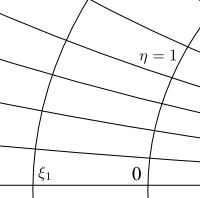 Let of be divided into subintervals (asymptotic lines at ) with . 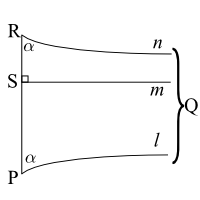 There is a rotation at infinity (an ideal rotation) that maps each line to the next one leaving the horocycles invariant (the horocycles slide along themselves isometrically). Hence, the horocyclic arc lengths are equal, so . for (usually so that the horocycles have unit speed). It is left as an exercise to use this to show that the equation for a horocycle in polar coordinates on the unit disk is . 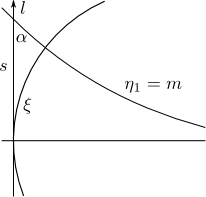 If we rearrange these equations, we get and , exactly the geodesics that we expect in the half plane model. Hence all three models discussed are quite consistent with one another. I hope that this exposé on hyperbolic geometry has been interesting, and I encourage you to read more on the subject.